The Big Dipper Said: Sew Weekly ENGAGE! Hello from beyond the weekend! I had a great one, folks. My high school reunion was Saturday, which was crazy! And weird. But I'm glad I went. I'm sure most of y'all in the sewing blog world are on top of the Sew Weekly by now (if not, click link! Check out. Is cool). I've been creeping on it for months and months now, but never participated in any of the challenges. That all ended two weeks ago, though! I've decided to start trying to do at least some of them. a) I'm starting slow, projectwise. Especially over the next month or so when I am mired in the web of sewalongs and projects to which I have overcommitted myself, the things I make will be small. As you'll see in a second, my past two projects have been an embellishment for an existing garment and a refashion. I want to take this less as "check out my perfectly turned out new garment I am a wunderkind" and more in the spirit of "make stuff, be creative, act in community." I think I'll stay on the refashion tip for the most part--I have such a pile of imperfect clothes, and no excuse not to dive in. b) I am giving myself permission to wimp out a reasonable amount of the time. This one's tricky, since allowing myself to renege on a standing commitment sort of enables the type of weaselly, nonproductive flake-tendencies I am attempting to train myself out of in 2012. I do plan to keep up almost week for week--but it would be unreasonable to imprison myself in an ironclad weekly commitment, and just plain silly to keep myself from participating at all on account of my own fear about self-imposed deadlines. Maybe I can give myself a week off a month or something? I'll think about it. With that out of the way, let's take a look at what I've done so far! 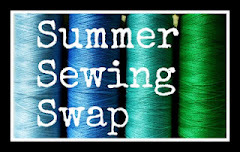 I've written posts about both items over at the Sew Weekly; I think I'll probably keep doing that, and bring the posts over here if I make something I'm especially proud or excited about. But we'll see! First up: the Diamond Jubilee challenge! You are on a major creative roll, dear gal! Love the revamped Hawaiian shirt and could definitely see wearing it with cute vintage skirts and high-waisted jeans all summer long. LOVE the revamped Hawaiian shirt - definitely Xanderiffic!! Seriously, Xander has got some crazy print shirts - I just started rewatching the series from the beginning and the one electric blue print from last night's marathon was epic. I love your version - perfect for summer and it looks great tied in front! Excellent refashion, my friend!